Tim Walbert is well-known in the world of pharmaceuticals, having led the team that built the strategy behind the multi-indication blockbuster autoimmune drug HUMIRA, the best-selling drug in the world. 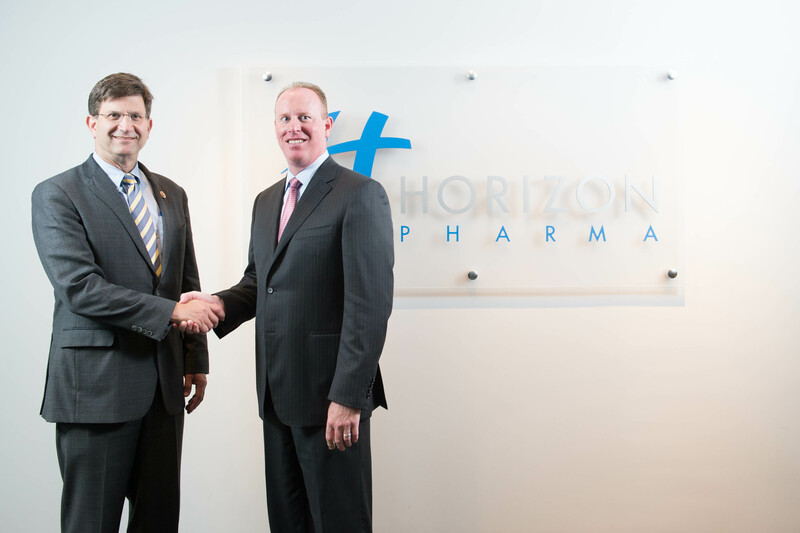 Walbert is now chairman, president, and chief executive officer of Horizon Pharma, Inc., a specialty pharmaceutical company developing products for primary care physicians, orthopedic surgeons, and rheumatologists. So far, 2014 has been amazing for the small company. The company’s share price has climbed 80 percent since the start of the year, despite the biotech industry experiencing a rough patch. Here, Walbert talks about the growth of biotechnology, the importance of bringing in new talent, and the company’s move to Dublin, Ireland. You’ve been in the industry two decades. What are the biggest shifts you’ve seen during that time? Tim Walbert: If you look at the 1990s and early 2000s, large pharma was growing on a monumental scale. What we have seen after the first decade of the 2000s is biotech and specialty pharma companies taking off, with biotech companies often filling large companies’ pipelines. This created an environment where companies that don’t fit the huge business model of pharma can still drive profits for shareholders, which clearly benefits us. We’re also seeing more of a balance between big pharma and big biotech, filling the pipeline with more efficiency and access, so we’re seeing larger growth with companies that don’t fit the old business model. In the 1990s—other than Amgen, Genentech, and a few others—our industry was dominated by large pharma companies. We are now seeing the diversification of the industry, and it’s creating opportunities for entrepreneurs like me to create new business models. You recently said you wanted to position Horizon to perform strongly financially and then leverage that to grow the business into a specialty pharmaceutical company, and you’ve recently marked five consecutive quarters of revenue growth.So, phase one is going smoothly. What about phase two? Walbert: Yes, this growth has provided value to shareholders and to the company. As a specialty pharmaceutical company, we have a very focused business model that is three-pronged: primary care physicians, orthopedic surgeons, and rheumatologists. With the acquisition of Vidara Therapeutics, we will add Actimmune, adding focus on products for orphan diseases, which are rare diseases. We’re not big on the research component, but every day we’re seeking to improve the products we offer. We’re continuing to drive growth for our products among our three focused targets, and we’re going to continue bringing products to those areas. We were valued at about $200 million last year, and with the close of our Vidara acquisition, we will be valued at about $2 billion now. In three to five years, we hope to be a $5–10 billion company. The success is clear, but what were the challenges of making all of this happen? Walbert: We went public in July 2011, in the middle of the European debt crisis. We weren’t able to raise the full amount of capital we needed. It’s a real struggle when you don’t have the optimal amount of money, but you still have to execute. There was also some restructuring, which isn’t always easy. Through it all, we counted on the leadership of the company pushing through many challenging situations. We continued to expand our leadership to drive the long-term growth of the company. In March, we added Bob Carey [executive vice president and chief business officer] to the organization. Bob ran the life science investment banking unit for JMP Securities for eleven years. Our chief medical officer [Jeff Sherman, MD] has worked with me across four companies. Our chief financial officer [Robert De Vaere] had almost twenty years of experience in finance before joining us. Why was it necessary to bring in so much new talent as you entered the next phase? Walbert: It’s key. Part of excelling is choosing the right people. When it comes to senior leadership, sometimes you need to bring in new talent. Those who got you to where you are aren’t always the same people who will take you to the next level. It can be challenging, but it can also be an exciting time. We had to evolve the leadership of the company to move forward with the next steps, especially with an acquisition strategy. Tell me about Horizon’s recent, big acquisition. Walbert: We announced the acquisition of Vidara Therapeutics in March, and as a result we’re moving our headquarters to Dublin. There is lots of talk of moving to Dublin for tax reasons. For us, yes, it’s an opportunity to realize a lower tax rate, but the value proposition associated with acquiring Actimmune greatly outweighed the tax benefits to us. It’s strategic in many ways, providing us a platform to continue to aggressively acquire new products. It’s early on in the process, but how do Horizon’s employees feel about the move to Dublin? Walbert: It’s a big shift, but I can safely say the employees are happy. Our stock went from $2 to $16. It’s great to see employees who have made money, and have made money on our stock, who can now put a down payment on a home or do things they have been waiting years to do. Morale is at an all-time high. Growth means promotional opportunities at what is quickly becoming a multibillion dollar company. There is excitement around the strategies we’ve articulated for the year. Every employee is a shareholder, and when there is a sense of ownership over the organization, there is excitement to share the strategy and the rewards. Where do you see the industry going next? Walbert: We’re seeing a flurry of inversion deals, and I don’t think that’s going to change. A lot more companies are looking to acquire companies outside the US, and like us, they will move their headquarters to compete and acquire other assets. If you’re not doing that, you’re going to be at a competitive disadvantage.